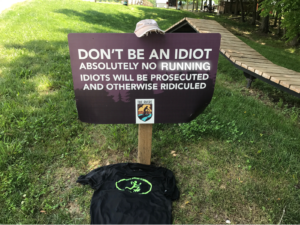 Idiots Running Club – Run. Smile. Drink Water. Don't Die. Everybody that runs has at least one person in their life that will call them an idiot. Just the way it is. In most cases it is probably true. Only an idiot would do the things we do. Running in the heat, cold, rain, wind or snow. On the roads, trails or treadmills. Trips/vacations are planned around running events or training schedules. We set alarms on the weekends so we can go long. Ice packs, ace bandages, foam rollers, ibuprofen, and good old DIRT can fix any injury.